If you don't want to go through the time and expense of installing permanent patio covers over your outdoor entertaining spaces, a fabric shade offers a cheaper and more temporary alternative. 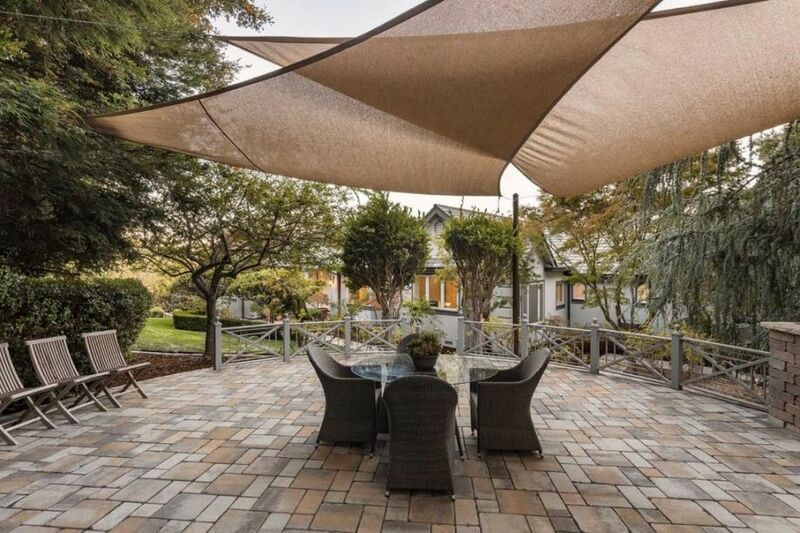 A patio shade is extremely versatile as they are available in an endless number of shapes, materials, colors and patterns to coordinate well with any landscaping or architectural design. You can get an awesome contemporary style design like this triangular version, or you can go with a classic solid or striped awning as are often seen in traditional homes. No matter what kind of patio canopy you choose, I would recommend doing a lot of research on the durability of the material. Building a patio cover is one of those home improvement projects that can add a lot of value to your home -- both resale value as well as quality of life. 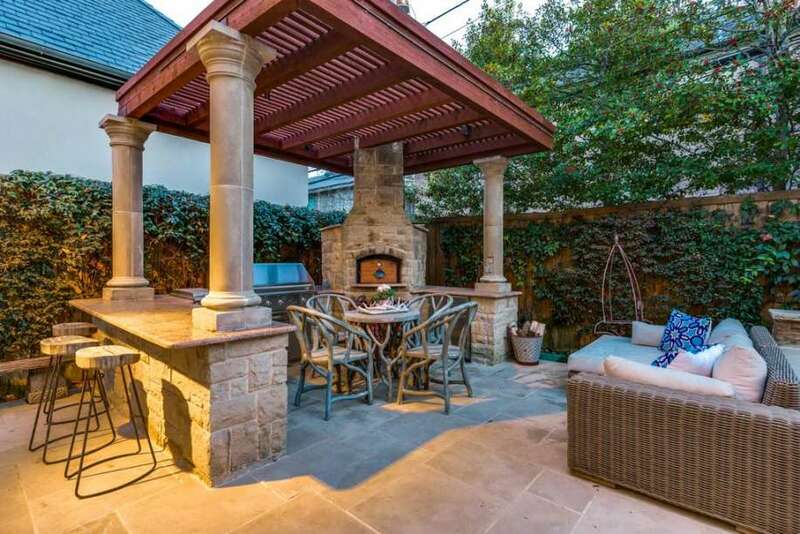 They offer a way to spend time outdoors all year round by shielding you from rain and storms, and allowing you to better heat a patio area even in chilly fall or wintertime weather (depending on the region you live in). This fabulous rustic home is a great example of how you can use patio covers to create a faux four season room. The homeowner built a roof out of beautiful wood panelling that perfectly coordinated with the grey stone siding and existing window trims. 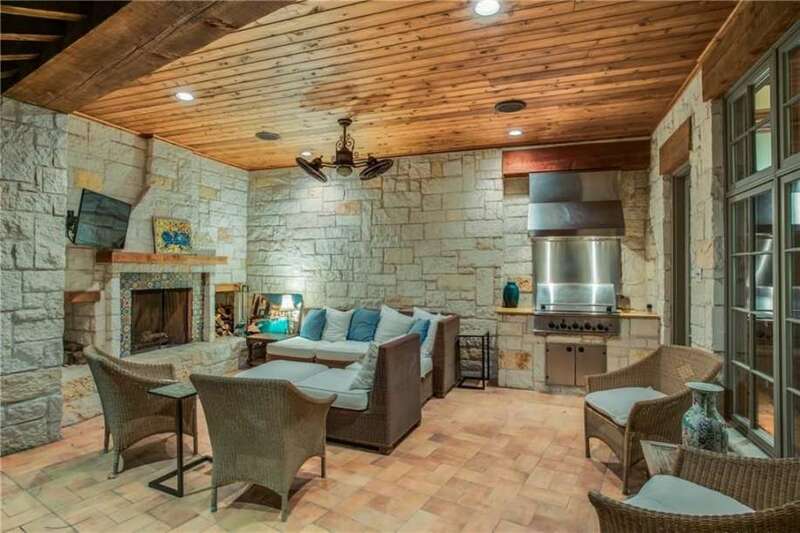 The patio roof drastically improved the versatility of the space because it traps the warm air emitted from the outdoor fireplace, transforming the patio into a heated room. The porch decor is the next item of interest in this image. 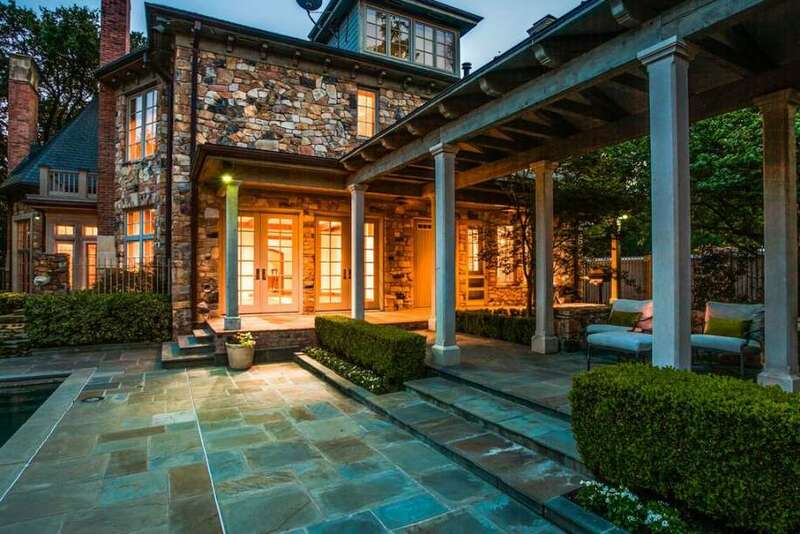 With a wide roof and arched entryway, it frames the lower half of the home very well indeed. Perhaps the first thought would be given to the many windows, both for the sheer number, size, and design. For those who appreciate natural light, this house promises to deliver. Because it is a true covered porch, it also provides an extra living space without the need for patio covers. This grand, spacious house catches the viewer’s eye in many different ways. Lastly, while the landscaping hides this fact somewhat, the flower beds are small and low-maintenance. The tree close by is positioned for maximum shade and minimal leaf clutter. I have been on the hunt for pergola covers for my patio that would add something to our outdoor design rather than distract from it. Too often, patio covers become an unfortunate eyesore in an otherwise fantastic landscape. The bold colors and distracting patterns tend to draw the eye away from other focal points like lush plants or a fantastic outdoor entertaining space. I have decided that the only options I would even consider are wood patio covers. The natural materials seem more "one with nature" and blend much better with other architectural features on our home. Even better, they age well and become even more beautiful as the years pass. A patio awning can sometimes be an essential part of your outdoor entertaining spaces because they provide shelter from inclement weather and heavy sun. Unfortunately they are oftentimes not the most decorative feature in the world. Not to worry though, you can actually make patio covers a positive rather than negative feature in your landscape design as long as you select the right option for your space. This home is a great example of how you can take advantage of a covered area and make it a beautiful upgrade to your home. My favorite material is actually aluminum patio covers. I find them to be the most durable, very well priced, and quite versatile in styles and finishes. 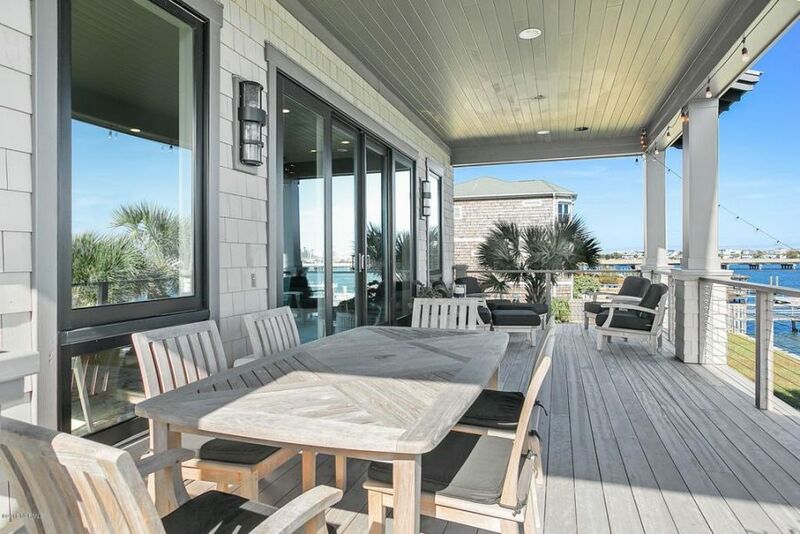 If you have lived or stayed on the water for even a short period of time, you know how essential a deck shade is. The sun tends to be quite strong alongside the beach or lakes, and can make sitting outside rather hot and uncomfortable. You want to be able to enjoy these gorgeous views in comfort, and the best way to do that is to add patio covers to most of your outdoor sitting areas. This can be anything from a simple retractable fabric awning to a built in paneled ceiling like this one. In my opinion, the best choice is always the most durable. While a fabric deck cover does offer a quick and inexpensive solution, they often do not make it through a heavy thunderstorm, and certainly not a tropical event such as a hurricane.